I love shooting with manual lenses. In certain ways, it's easier than relying on Auto-Focus, and the now overly complex systems behind them. Auto Focus is supposed to mean that the camera will do the focus for you, and will do it quicker than if you focus manually. But that depends - if you have to take three or four shots in order to get the focus where you want it, AF is just getting in your way. And besides, what is quicker than not needing to focus at all? It's a breeze to simply pre-set your focus on a manual lens, and literally forget about it - and there are many situations in which you want to have the greatest depth of field possible - and it is with these situations that you can use a manual lens with a genuine old school DOF Scale to truly "set and forget" your focus, using the "hyperfocal distance" formula. In addition, when you're in a tricky night-time shooting situation, where the Canon AF system just rolls over and dies, unless you use the extremely annoying burst-flash AF-assist, believe me, you're much better off with an old school MF lens that gives you a real distance scale, and a great big aperture opening (f1.8 or better) to bring in lots of light. After dark, you're going to shoot wide open in Shutter Priority, simply to get a decent shutter speed, unless you're using a tri-pod - in any event, the thing that'll save your bacon is to measure your distance to whatever you want to be in focus (arms' length - about three feet, walking stick, about five feet, and beyond five feet in the dark, it matters less and less). 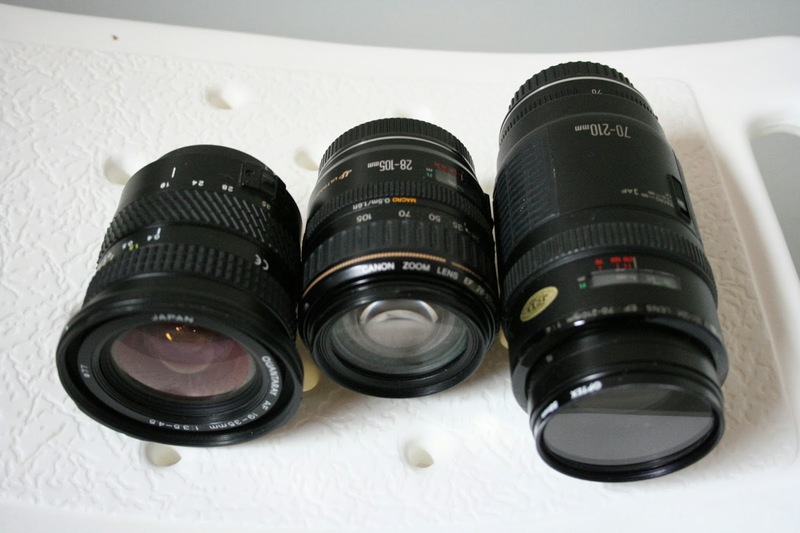 This is a very good way to get some of the greatest lenses that were ever made at extremely low prices too. I have nine M42 thread Mount MF lenses, most of which are truly remarkable in quality, and I got them all for just over $250! 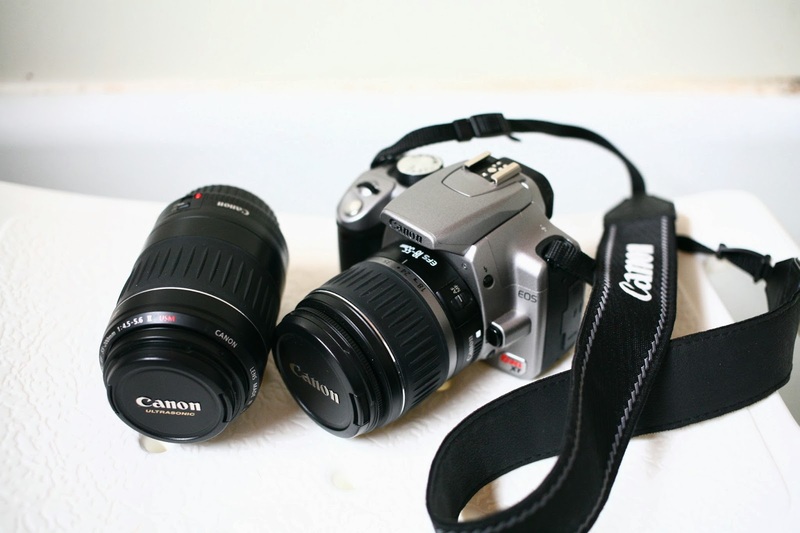 One of the problems that has emerged in the new era of digital cameras is "fear of the old". Marketers have convinced us that we simply must keep on buying a new camera every 3-5 years, to keep up with performance, features, and supposedly image quality. This is only fortunate for those who do not buy into this argument, and is causing tremendous price drops in older high-end camera bodies. The full frame (35mm) Canon EOS 5D was launched eight years ago for over $3000.00, and now you can buy them second hand for under $700.00 - in some cases, well under! I've already covered a strong argument that when it comes to Megapixels, and features on a 35mm DSLR, "less is more" - really! I like shooting with the 5D because it has a minimal feature set with (almost) everything in the right place. The viewfinder is big and clear, although not quite as good as found on the EOS film cameras. Image quality is spectacular, especially in low light. A lot of under-exposure can be dialled in to raise shutter speed, with little corresponding increase in noise - contrary to the APS-C (or 24mm) DSLR's. The downside? Not much of anything, except this is a very heavy camera, that's not quite as easy to hold as the lovely Elan-7 film cameras. If I could only have one camera instead of nine, it would be this one, considering everything together. What? A digital, and not film? Well, it's almost as good, and I'm still in a digital workflow whether I'm using a digital or a film camera, so yes, this one makes the most sense. Oh yes - I should comment on why the very tiny Industar 50-2 lens shown here is "my favourite lens". Simply because it's truly amazing! How can a lens, made in the former USSR, and so small it looks silly on any camera - even the old Zenet-E it was intended for, be so good? I'm sure the magic is in it's simplicity. Everybody should own one of these if they have a Canon or Pentax DSLR, and want to "wake up" your camera to it's best potential for under $50.00, including the adapter! Want to get back to basics, deprive yourself of all modern automation, and really learn what photography is all about? Want to be able to shoot without batteries? Want to learn how to get reaally good at getting the correct exposure by intuition? Want to make photographs that truly have a touch of yesterday without having to fake it? Want a totally different shooting experience? Then try an old Rangefinder. (OK the Trip-35 isn't a Rangefinder, but it sure looks like one, and has an image quality that's top-notch and totally unique). A Russian Rangefinder like the FED-5 especially can give you a pretty good idea of what it's like to shoot a Leica camera, because they're copies of the essential old Leica design. You can even use a Leica lens on one, although you probably would think twice before putting out that much money. But who needs a Leica lens when you can have the fixed 45mm f1.4 lens on the Yashica Lynx-14? I can tell you, I've never seen more beautiful results on 35mm colour film, period! Truly amazing, and if you can find one of thee cameras in working condition, it shouldn't cost you more than $100. I got mine for $40.00. The downside? Plenty! Rangefinders might be the most accurate method of manual focussing, with it's simple alignment of a split image that can be accomplished very quickly, but unless this is the only type of camera you use, it's easy to forget that your viewfinder isn't looking through the film lens. You could shoot a whole roll and not remember to take the lens cap off - it has happened! Do you need a true "PHD" (press here, dummy) camera that truly does everything for you and still takes excellent pictures? Do you want a camera that's even simpler than a digital point and shoot - in fact, even simpler than a smartphone camera? In the 1990's, Pentax, Canon, Minolta, Nikon, and quite a few others made these black plastic battery powered film cameras with zoom lenses that had auto-everything; they even loaded, advanced and rewound the film for you. They required almost no setting up (unlike today's digital point and shoots, which can be downright baffling). There were typically only three controls - a shutter button, zoom toggle, and flash control (which you might as well set to "automatic"). But I can at least vouch for the Pentax Zoom 90 - they take fantastic pictures!. You can even get quite serious with one, as perfect focus is attained instantaneously. People watching you use one of these will never take you seriously, but you'll know differently, making these the perfect street camera! 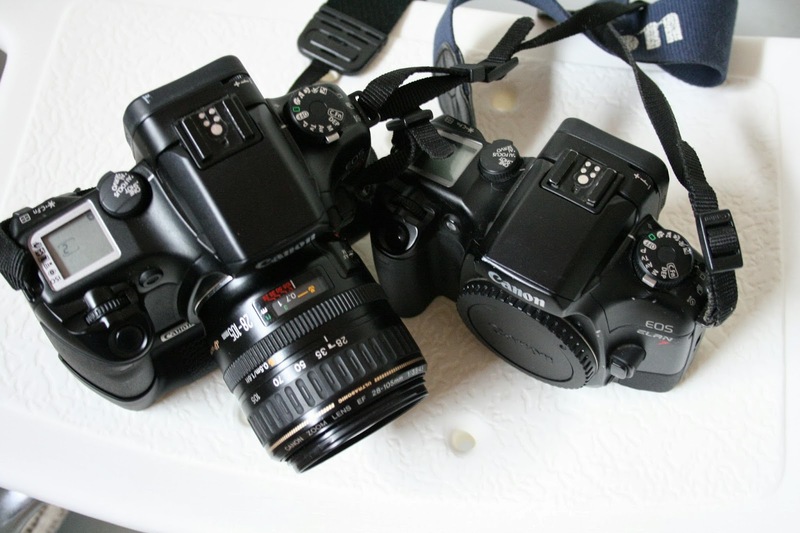 Like the 5D Classic, the Digital Rebel XT is about eight years old. It is quite simple to set up and operate, with only features that would be considered "essential" by today's standards, meaning it has far less unnecessary features than a similarly priced digital point-and-shoot. Pixel Density is low, and so light capture and noise performance are better than what would be expected. It is light-weight, and even the very cheap and now infamous 18-55 kit lens performs better than it looks like it should. Typically, these are selling for $200 or less, with lens, making them a viable camera for any DSLR beginner - I doubt the price would ever be much lower, and it should be an easy re-sell if you feel you must upgrade - personally I wouldn't. It's a great little grab and go camera. As with the 5D, the rear LCD is very poor by today's standards, but one should use a DSLR's rear display to show the Histogram instead of the actual picture just taken - even with the best modern LD's you can learn more from "chimping the histogram". 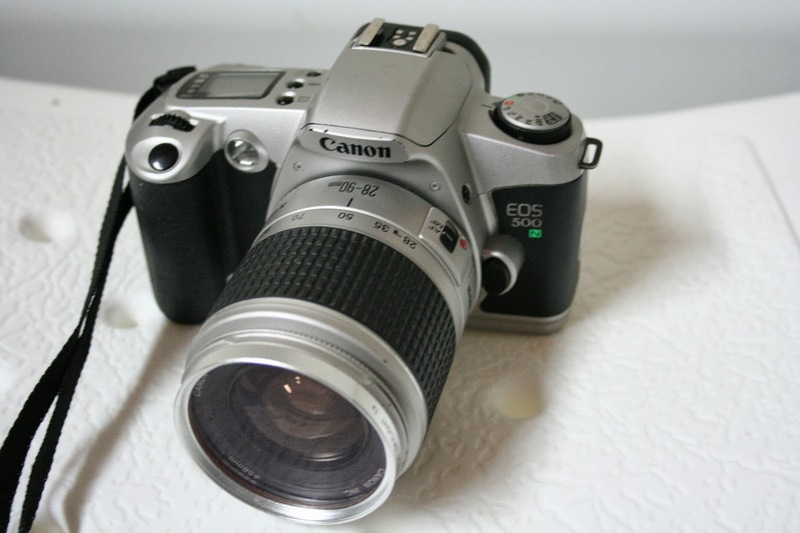 Also, this was the last Canon EOS "Rebel" camera to have a separate Info LCD, which was on the rear where it can be more easily seen with the camera on a Tripod. It is far more typical to have these on top of the camera, if it has one at all. It operates like any other Canon DSLR - always fast and dependable, in spite of the plastic construction common to the Rebel series - with a big advantage of light weight. Obviously, these cameras can last just as long as their bigger brothers, although they're not meant for professional use. Now, we've come to my favourites. The Elan-7 was Canon's last mid-level film SLR, and it is amazing how similar they are to all EOS DSLR's of any series, right up to the present day models. Although not built like Pro models, they're much better than the Rebel series. There are two huge advantages to these cameras - one being that the Viewfinder is bigger and brighter than I've seen with any camera - I'm sure there are a lot of cameras that are better still, but the Elan-7 is the best I've experienced personally. 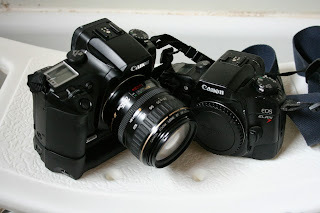 The other thing I love about them is their perfect weight and handling - you can see they're shaped quite different than any of Canon's DSLR's - it seems to be a formula that really worked well. Another thing I like is how the Drive and AF Mode Functions are set with real switches on top of the camera. These aren't things you change a lot, but it adds a touch of real quality. Really, I can't think of anything not to like about the Elan-7. They work just like all of the newer DSLR's, run on two CR123 batteries, or with the battery grip, will also work with four AA's. 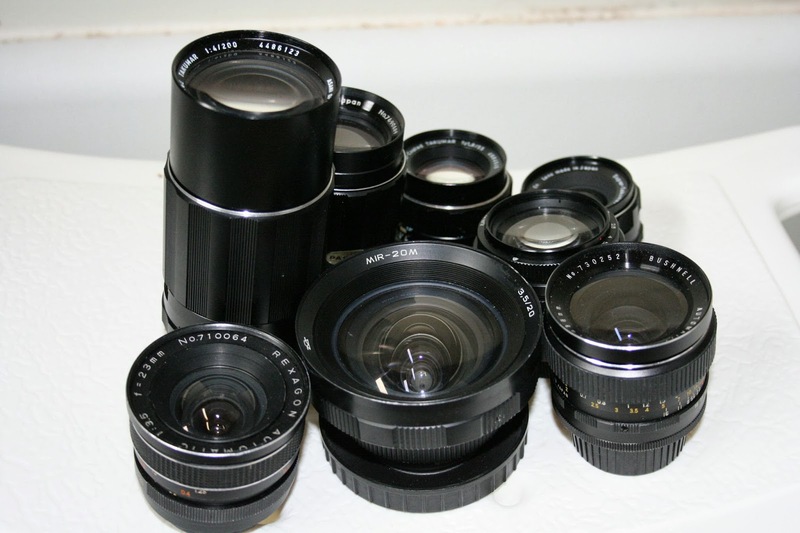 All of Canon's EF lenses, even those with Stabilization will work on these film SLR's - really, you almost have to keep reminding yourself that you're shooting film, not digital. There's even Canon's familiar "Custom Functions" menu, with a lot of the same settings used by the digital SLR's. It seems that Canon hit on some great things in the late 1990's, and have carried the same basic design ideas through to the present day. Why do I have two of them? Well, for $20 each, why not? Unlike with digital cameras, film only comes in one ISO, so by having two identical bodies, you can load one up with ISO 160 and the other one with ISO 800, for when things get dark, or fast. And why not have a third compatible film body on hand for yet another film type? I simply had to buy a film Rebel, to compare it to a Digital Rebel, and for $20 with lens, and good batteries, again, why not? Again, like the Elan series, these are now one of the most overlooked bargains of all time. The Viewfinder is far bigger than any Digital Rebel (to be fair, it's because a film camera uses a bigger 35mm, vs 24mm frame) - it's not as good as the Elan-7, but comparable to the EOS 5D (35mm digital). Another big plus for the Rebel G is it's incredibly light weight, especially with the kit lens. Everything is plastic - even the lens mount, but in spite of that, the Rebel G still inspires confidence. Feature-wise, it's really bare-bones, which I like, if you haven't noticed. It only has one control wheel instead of the Elan-7's two, which makes some settings a bit awkward - same problem is carried forward on the Digital Rebel's by the way. It remains however, that even with a plastic mount, any EF lens will fit this camera, and you can even use a Canon "L" Series (Mega - $$), and why not? It's film- The result would be spectacular, even though the idea of putting a $2000 lens on a $10 camera seems ludicrous, it would work just fine. One thing I should mention is batteries. 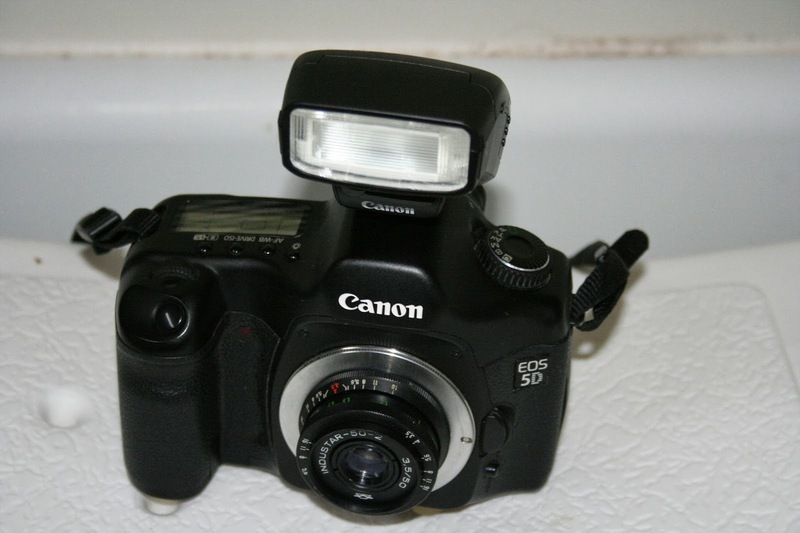 Some older EOS cameras used the 2CR5 battery - avoid these like the plague! The Elan-7 and Rebel G both use the far better CR123's. These older Lithium camera batteries are getting expensive right now, and twice, I've bought a 2CR5 for the old EOS 650 I had, only to find they were depleted, right off the shelf. I've never had this problem with CR123's. In fact, I just ordered eight pairs of them from a Hong Kong Ebay seller at a very good price, and all of them tested fine. So, especially if you come across one of these Rebel film SLR's, make sure it uses CR123 batteries! I gave the EOS 650 away to a local charity yard sale because of the deplorable 2CR5 battery - far better to have it be somebody else's problem. I forgot to show a picture of the EF 40 f2.8 STM Lens (just Google it). This in fact is my second favourite lens, which says that for some strange reason, my favourite lenses happen to be the smallest and less costly in their categories... I actually prefer them for their image quality in both cases. Between the two of them, the range is covered from 40mm through 80mm, because on the 35mm body, the Industar 50-2 and EF 40 give me 50mm and 40mm, while on the 24mm body, they give me 80mm and 65mm. Adding it all up, my photo gear gives me so many different ways to shoot, and yet, especially within the Canon EF system for film and digital, with which all the M42 lenses also work perfectly, the whole thing works together, with the old school and P&S film cameras serving as extras, or loaners, or educational pieces, etc. 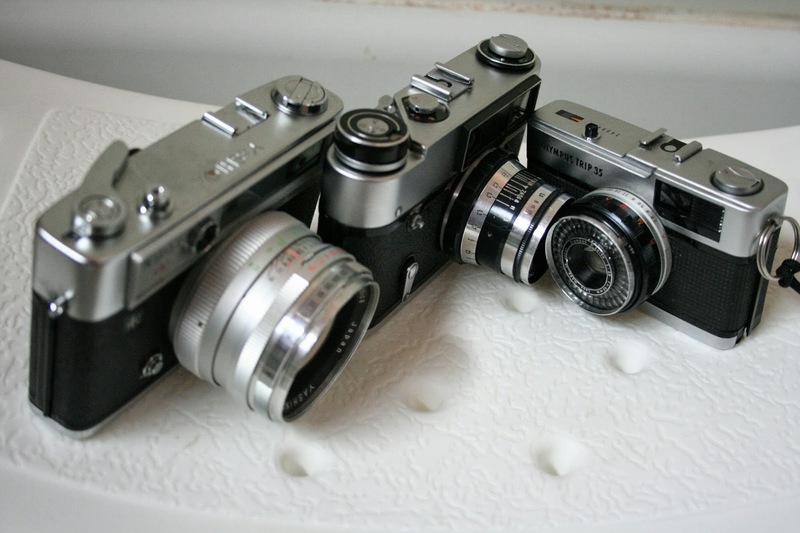 could you comment on the lens quality of the FED-5 with Industar-61? I like it. 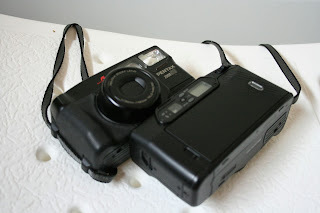 My Industar-61 is a very early copy (50mm instead of 55) and really is not a good copy. But especially when printed, it has a wonderfully charming look to it - colour is quite muted, but natural, and there's an etchiness to it, as opposed to the more buttery look of Jupiter lenses, which I think most people prefer. I see it as an "artsy" lens. And of course, the Industar is by far the cheapest lens you can buy for any application, so it's great in terms of value for money.